From rambling nature hikes with small children, to quick day hikes, to a challenging backpack adventure, the Swan Range has it all. And, in winter, there's skiing and snowshoeing! The sweeping view from the Swan Crest is unforgettable, with Swan and Flathead Lakes gleaming on one side and the jagged majesty of the Bob Marshall and Great Bear Wildernesses on the other. Flathead Valley locals and visitors alike treasure the hundreds of miles of trails available for hiking, horseback riding and llama packing. You can enjoy the Swan Range in solitude or with others. 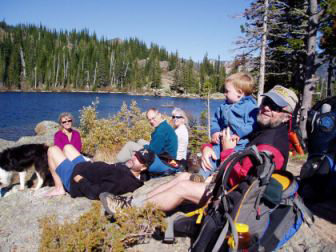 The Swan Rangers are a self perpetuating informal outdoor group, a great way for folks to make new friends, and an opportunity for folks to learn new things and new places in the northern Swan Range. The Swan Rangers meet every Saturday morning at the Echo Lake Cafe for breakfast and a partial day of hiking, snow-shoeing, or skiing together in the nearby Swan Mountains and foothills. Each Saturday group determines its own destination and folks not eating at the cafe can just show up by departure time. Car pool parking is available in the Swan River School parking lot, across Echo Lake Road from (and not in) the Cafe parking lot. Come prepared to either hike, snowshoe or cross-country ski depending on snow amounts and conditions. Be sure to bring a lunch, water, warm clothes and other items from the Ten Essentials list below. During hunting season, it is also a good idea to wear "hunter orange." Please tell your friends and bring them along for the fun! 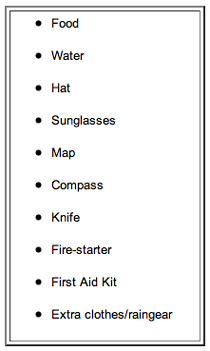 Always remember bear spray and the "ten essentials!" Visit Dr. Hike a Day! Read the Swan Ranger Outing photo reports here.